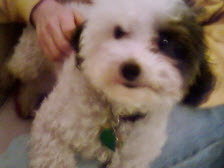 On average, my malti-doodle, Uma Thurman uses two doggy bags a day. 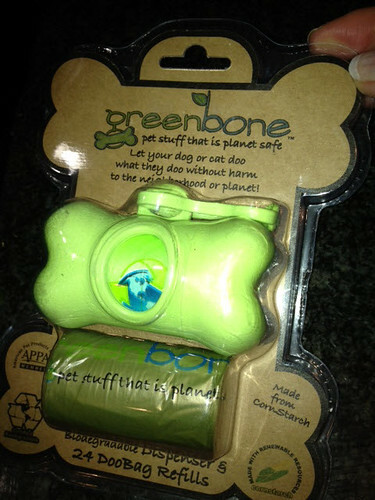 As part of my resolution to be more eco-friendly in 2012, I decided to use biodegradable dog poo bags. It makes me feel like I'm doing my part for the environment in a very intentional way. And it reminds me daily of the need to be a good environmental citizen. Not only are the bags biodegradable but the dispenser was made from biodegradable alternative plastic. All great. The only problem is the "clam" packaging. It's very non-biodegradable. Whatsup with that? According to Lewis Hamowy of Greenberry Eco Industries trying to create eco-friendly packaging is a lot harder than creating eco-friendly products. Hamowy says while he hates the "clams", (those ridiculous plastic packaging nightmares that require either really good scissors or a paper cutter to open) there really isn't an alternative out there, at this time. Hamowy says that between pilfering(a nice word for stealing) and the general requirements for getting a product on the shelf, the company had no alternative than to use the non-environmentally friendly packaging. Hamowy says the company is working on alternatives and hopes to have a new product launch by June. Still, until I personally spoke with Hamowy, I was tempted to make a lot of fun of this company for packaging their eco-friendly poo bags in the despicable plastic clams. That's why I think they need to add a disclaimer on the packaging, giving a hat tip to the irony that a eco-friendly company is forced to use packaging that is not. They should also communicate to customers that they are working on a better packaging solution. Received an email from Hamowy with a prototype of a new design...that eliminates the plastic clam.